looking at me, looking at you is a video installation seeking to undermine stigma by provoking it into awareness. On 3-6 video monitors, people who have been directed impacted by HIV/AIDS watche us watching them. No additional information is given regarding the subjects. There is no soundtrack. The subject looks into the camera for an extended period of time. The context in which they are being filmed are indistinct interiors or exteriors, both public and private. As we watch, the faces change as the subject experiences thoughts and feelings. They know they are being watched. Click on pics for sample. Perhaps they are projecting onto us — the observers. Perhaps, we project onto them. The meanings and stories which arise, not to mention the lived experience of subjects and observers, is the spine of the project. The substance is the mutual gaze. As observers, we get to directly engage with the subjects without comment, narrative or backstory. All we have is the person that we are looking at and the meanings they provoke in us. These meanings have broad implications for our daily lives, public policy and education, and health/wellness outcomes. With a long history of international community-building amongst vulnerable peoples and others, the artist hopes that looking is a sound foundation for a variety of community-activation and education initiatives: knowledge exchanges, festival events, expert panels and collaboration with other artists. The installation is 3-6 video 22″ IPS monitors, side by side, in a line. Each is equipped with an HDMI stick with a full Windows operating system controlled by a wireless keyboard. This allows site staff to activate the monitors independent of the artist. We seek to install the project in a gallery or other appropriate spaces. looking at you, looking at me has its inaugural showing in a limited engagement at Buddies in Bad Times Theatre starting May 3, 2017 in the theatre’s ante-chamber. The installation is programmed for several weeks as a complimentary add-on to the run of Toronto-based playwright Sky Gilbert’s provocative new play, It’s All Tru and other programming. We are actively seeking future sites to host looking at you, looking at me. thom is available to help community-based agencies, organizations and others develop awareness, education and advocacy through a variety of arts practices, including creating similar installations representing their own communities. For more information, please contact thom@thomvernon.com. The subjects are a diverse group of 3-6 people who’ve been directly impacted by HIV/AIDS. The project will reach out to local HIV/AIDS organizations, community-based networks and known contacts for subjects and partners. 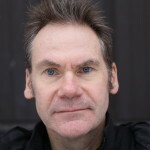 thom vernon, a Toronto-based writer, educator and performer, is the lead artist. 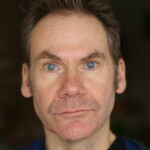 He has lived with HIV for almost thirty years while acting in Hollywood (Seinfeld, The Fugitive, etc. ), becoming a professional writer/educator and being forced into exile. He is the former Director of Education & Participation at Toronto’s Lorraine Kimsa Theatre for Young People (now Young People’s Theatre) and a co-founder, facilitator and former Managing Director of Arts Expand, a non-profit arts education initiative in Los Angeles. He has developed and facilitated hundreds of arts education sessions with everyone from toddlers to gangs to seniors. It is what passes human to human in the gaze — what cannot be captured in words— that inspires him to do this project. HeeJoo Yoon, a Toronto-based filmmaker, cinematographer and screenwriter. Gallery/Public Space: long flat wall or other appropriate configuration. 3-6 wall-mounted, 22″ IPS video monitors. If you are interested in participating or supporting the project, please contact thom at thom@thomvernon.com.